Microarray Analysis of Bacterial Pathogenicity. The Extracytoplasmic Function (ECF) Sigma Factors. How oxygen damages microbes: oxygen tolerance and obligate anaerobiosis. Drug resistance in yeasts - an emerging scenario. The physiology and collective recalcitrance of microbial biofilm communities. Biochemistry, regulation and genomics of haem biosynthesis in prokaryotes. Global adjustment of microbial physiology during free radical stress. First published in 1967, Advances in Microbial Physiology is one of Academic Press's most renowned and acclaimed series. The Editors have always striven to provide a diverse range of top-quality papers on all aspects of microbial physiology. Coverage of 'holistic' topics or whole cell studies such as ion fluxes, stress responses and motility have gone hand-in-hand with detailed biochemical analyses of individual transport systems, electron transport pathways and many aspects of metabolism. 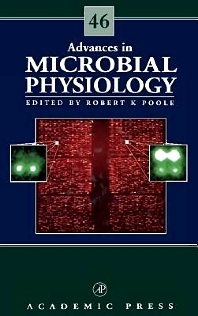 Now edited by Professor Robert Poole, University of Sheffield, Advances in Microbial Physiology continues to publish topical and important reviews, interpreting physiology in its broadest context, to include all material that contributes to our understanding of how microorganisms and their component parts work. In 1999, the Institute for Scientific Information released figures showing that the series has an Impact Factor of 5.35, with a half life of 8 years, placing it 5th in the highly competitive category of Microbiology; testimony to the high regard in which it is held. Microbiologists, biochemists, biotechnologists, and those interested in physiology and microbial biochemistry.